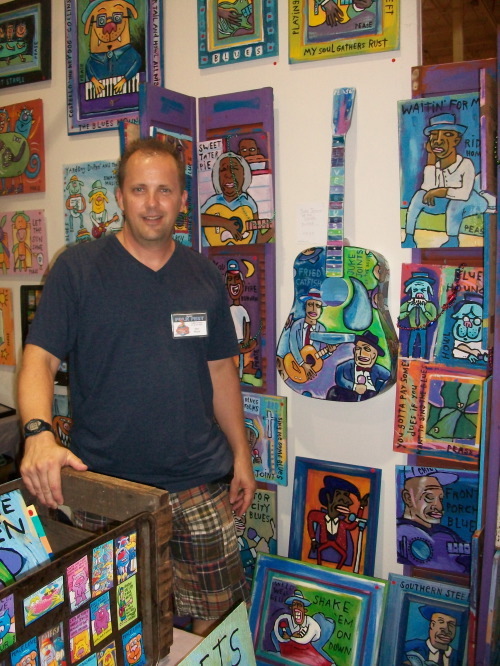 He loves the blues and much of his artwork features Blues Musicians from yesterday and today. He has exhibited in several House of Blues locations. He loves animals as well and created “Blues Hounds” in his paintings and recently published a coloring book called “The Blues Hounds and Other Rock & Roll Animals". His kids inspire his work quite a bit, too. He says his goal is just to make people smile, or sometimes think or maybe cry a little bit (but mostly smile). He trys to tell a story in his art, whether it is the story of a musician, a song, an event, or a feeling. He also designs music concert posters and t-shirts. The only item that we have by Ken at this Time... is his coloring books.